Decide to Lead explores decision-making and all its complexity. Decision-making is, and has always been at the heart and soul of leadership activity. Leaders are responsible and held accountable for the decisions that are made within the organization, whether they personally make them or not. 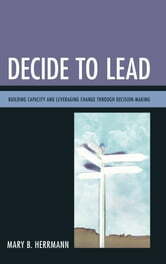 Enhanced with resources and questions for further reflection, Decide to Lead examines decision-making through the lens of a leader. The book addresses what leaders know: knowledge of self, knowledge of others, and knowledge of one’s community and context; how leaders think, with a focus on cognitive systems and the forces that influence decision-making; and what leaders do to set up the conditions for effective decision-making in their organizations. This includes leader actions such as building capacity, designing a decision friendly organizational architecture and effectively employing decision-making models and processes.